Stacy Peralta returns to skateboarding culture with mixed results in Bones Brigade: An Autobiography. 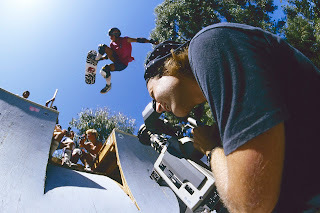 A sort of sequel to Dogtown and Z-Boys, which focused on his mates in early 1970s crew Zephyr, Peralta’s new film turns to the titular group of talented young misfits that he and business partner George Powell recruited in 1978, who went on to dominate the sport for the next decade. Like Dogtown, this is a likeable memory box of a movie, which briskly mixes up talking head interviews with scratchy archival footage and snapshots visibly manipulated by the director’s own hand. Peralta has a knack for converting alternative social history into this strangely effective hybrid of MTV and family album aesthetics. His firsthand experience and easy conversance with his subjects – who sometimes boyishly narrate his past actions to him with the kind of reverence guys usually reserve for dads and deities – makes for a good hook, and certainly there are worse tour guides through skater culture than a scrappy Jeff Daniels doppelgänger. Still, for an autobiography, this enthusiastic campfire reunion can feel cursory, especially at a bloated two-hour running time.